So you’ve decided to set up an online Bank of Mom/Dad to teach your kids good money habits from the get-go. Kudos! Now what? What’s the best way to get your kids on board? How do you tell them what it’s all about? How do you lay out the rules for your new bank? We get those questions a lot from our new families, and frankly, we don’t always have the most brilliant response. But thanks to FamZoo dad Mike P., now we do. 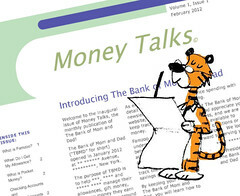 Last week, Mike emailed us Volume 1, Issue 1 of the Bank of Mom & Dad Money Talks Newsletter. He wrote it for his daughters while commuting on the train. I love it. It’s the most clever intro to an online virtual family bank I’ve seen yet, and Mike was kind enough to let us share it with you. Maybe you’d like to put together something similar for your kids. Feel free to steal liberally from Mike’s terrific example. Customize it to match your bank’s rules. When Do I Get My Allowance? Do I Need Permission To Spend My Money? Welcome to the inaugural issue of Money Talks, the monthly publication of The Bank of Mom and Dad! The Bank of Mom and Dad (“TBMD” for short) opened in January 2012 at ** ****** Avenue, *********, New York. The purpose of TBMD is to help ***, **** and ***** **** manage their allowances, gift money, and any money they earn doing extra chores around the house. As explained in greater detail elsewhere in this newsletter, TBMD uses a website, Famzoo.com, to keep track of each girl’s money. Famzoo will help the girls understand the difference between “checking accounts” and “savings accounts”, and will also help them create and track their own individual savings goals. By keeping your money at The Bank of Mom and Dad, you will learn how to balance spending with saving. We at The Bank of Mom and Dad appreciate your business, and we are always available to answer questions or hear suggestions. We look forward to serving you! You will get a weekly allowance. You will manage your own pocket money. You will make your own spending and saving decisions. If you spend all of your money, you will go broke! The Bank of Mom and Dad uses a website — www.famzoo.com — to help keep track of allowances and the amount of money each girl has saved. Famzoo can be accessed using any internet browser on a computer or the family’s iPad. You can log on using the family name (“******”) (apologies to Mom!) and your first name and personal password. When you log on, you will see all the bank accounts that have been created for you at TBMD. Just like a regular bank, you have a “checking account” and a “savings account”. Later in 2012, after you understand a little more about saving and investing, TBMD will offer “certificates of deposit” for investment, that will let you earn even more money than your regular savings accounts! So, log on to famzoo.com and look around! In future issues of this newsletter, we’ll explain how to set up savings goals and other useful things provided by Famzoo. When Mom and Dad get paid for their jobs, their bosses don’t actually hand them money. Instead, their paychecks get deposited (or “credited”) directly into their checking accounts at Citibank and at Chase Manhattan Bank. they can use the computer to tell the bank to use the money to pay the family’s bills. So, just like your parents, your allowance will be “credited” each Friday to your checking account at The Bank of Mom and Dad. Then it is yours to use however you like. The important thing to remember is that money isn’t just the dollars and coins you hold in your hand — it’s also the amount that gets credited to your bank account, represented by a number on the computer screen! You may have heard Mom or Dad talk about “pocket money”? What is pocket money? Is it different than your allowance? When you get your allowance, you have to figure out how much of your allowance you want to keep in the bank, and how much you want to be paid as pocket money. Keeping too much pocket money can be risky! You might lose it, or it might get stolen, or you might be too tempted to spend it on things you don’t need! If you are running low on pocket money, you can withdraw cash from your checking account (by submitting a request to a TBMD staff member). If you think you have too much pocket money, you can deposit it at TBMD. Learning to manage your pocket money is very important! On Famzoo.com, you will have two accounts: a “checking” account and a “basic savings” account. What’s the difference between the two? A checking account means that the money is available right now — you can withdraw it for pocket money, or write a check to pay a bill using money in the checking account. A basic savings account means that you can’t get the money right away — first you have to move it from your savings account to your checking account, and that can only be done once a month. Another big difference is that you don’t “earn interest” on the money in your checking account. The money in your savings account, however, earns interest, which means the bank actually pays you every month! There are two ways to get extra money: you can work for it, or you let your money grow. When you work for extra money, you give up your time. Work for one hour, and get paid for one hour. When you let your money grow, you don’t have to work. Instead, your money works for you! You can get paid to read a book, or play a game, or watch a movie! How does this happen? By saving some of your allowance each week, you can make your money grow. The money you put in your savings account earns “interest”. This means that the bank is paying you for the privilege of holding on to your money. The money they pay you is called “interest”. Your TBMD savings account at pays interest at the rate of 5% per month. In other words, if you have $100 in your savings account for the entire month, TBMD will pay you an extra $5. (5% of $100 equals $5.) Putting $500 in your savings account means an extra $25 a month. An extra $25 in your bank account every month, for doing nothing? Sounds like a pretty good deal!! You don’t need Mom or Dad’s permission to spend your money, except for a few items. If you want, you can spend all the money you have on books, clothes, shoes, gifts, candy, Pokemon cards, comic books, movie tickets, and so on. Spending all of your hard-earned money right away might not be the smartest thing to do. If you spend all of your money, you will be broke, and will have to wait for your next allowance to have more. And you won’t have any savings to use for something special or unexpected. You can always talk to the staff at The Bank of Mom and Dad if you are not sure whether to spend money on something — we can go over the pros and cons of a prospective purchase. There are certain things you can’t buy without prior permission: any computer, cell phone or similar electronic device. But, if there is something in this list you really want, we can talk about it and come up with a plan. When you first log on to your TBMD account at Famzoo.com, you will see that all of your money (i.e., everything you have gotten up until now in First Communion money and allowance) has been credited to your checking account. You have to decide how much of that money you want to transfer to savings, and how much you want to keep available in your checking account (for extra pocket money). Remember, money in your savings account has to stay in there the entire month in order to get the 5% interest payment! Then transfer the rest to your savings account! Learning how to manage your own money is one of the most important steps of growing up. But good luck won’t always be there to help you deal with very bad money decisions. And if you lose your job, or get so sick that you can’t work, bad money decisions can make things 100 times worse. So Mom and Dad want you to learn how money works now, before you’re all grown up. We want you to learn how to spend, save and manage your own money. That way, you can be the smartest kids in town when it comes to money! The Bank of Mom and Dad was founded in January 2012, in **********, New York, by your Mom and Dad. TBMD’s mission is to educate ***, **** and ***** in the ways of money, while providing the highest level of customer service and satisfaction. TBMD offers checking, savings and money management services to all the children of Mom and Dad. We are an equal-opportunity employer. All deposits are FDIC guaranteed. Do you have a clever way of introducing your kids to your Bank of Mom/Dad? Do you have interesting bank rules like Mike’s above? Radically different ones? We’d love to hear your ideas in the comments below or on our Facebook page. P.S. Deposits in FamZoo aren’t really “FDIC guaranteed”, but I suspect they’re safer than leaving money lying around your kid’s room. Thanks for the post.. I download it.. from flickr set.